These carved figures are well known in Germany as "Kurrende Singers". It's a traditional Ore Mountains choir dressed in black; one person is carrying the star. To see original photos prompt the search engine to search for "kurrende erzgebirge" images. Also eligible for separate use in small quilts. Combine this pattern with the Church in Seiffen in 22 x 30 cm to get a festive scene. 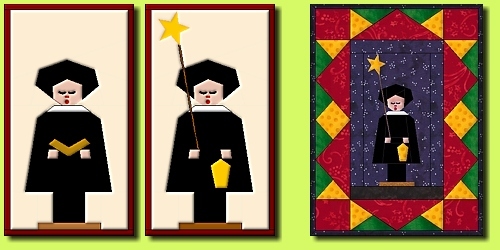 By request embroidery files for the faces (made by Helga Krausser) are provided for free.